The order application is a simple inventory and ordering application for maintaining a catalog of parts and placing an itemized order of those parts. The application has entities that represent parts, vendors, orders, and line items. These entities are accessed using a stateful session bean that holds the business logic of the application. A simple singleton session bean creates the initial entities on application deployment. A Facelets web application manipulates the data and displays data from the catalog. The information contained in an order can be divided into elements. What is the order number? What parts are included in the order? What parts make up that part? Who makes the part? What are the specifications for the part? Are there any schematics for the part? The order application is a simplified version of an ordering system that has all these elements. The order application consists of a single WAR module that includes the enterprise bean classes, the entities, the support classes, and the Facelets XHTML and class files. The database schema in the Derby database for order is shown in Figure 41-1. In this diagram, for simplicity, the PERSISTENCE_ORDER_ prefix is omitted from the table names. The order application demonstrates several types of entity relationships: self-referential, one-to-one, one-to-many, many-to-one, and unidirectional relationships. A self-referential relationship occurs between relationship fields in the same entity. Part has a field, bomPart, which has a one-to-many relationship with the field parts, which is also in Part. That is, a part can be made up of many parts, and each of those parts has exactly one bill-of-material part. Part has a field, vendorPart, that has a one-to-one relationship with VendorPart's part field. That is, each part has exactly one vendor part, and vice versa. Note that, because Part uses a compound primary key, the @JoinColumns annotation is used to map the columns in the PERSISTENCE_ORDER_VENDOR_PART table to the columns in PERSISTENCE_ORDER_PART. The PERSISTENCE_ORDER_VENDOR_PART table’s PARTREVISION column refers to PERSISTENCE_ORDER_PART's REVISION column. CustomerOrder has a field, lineItems, that has a one-to-many relationship with LineItem's field customerOrder. That is, each order has one or more line item. LineItem uses a compound primary key that is made up of the orderId and itemId fields. This compound primary key maps to the ORDERID and ITEMID columns in the PERSISTENCE_ORDER_LINEITEM table. ORDERID is a foreign key to the ORDERID column in the PERSISTENCE_ORDER_CUSTOMERORDER table. This means that the ORDERID column is mapped twice: once as a primary key field, orderId; and again as a relationship field, order. The order application uses several types of primary keys: single-valued primary keys, generated primary keys, and compound primary keys. 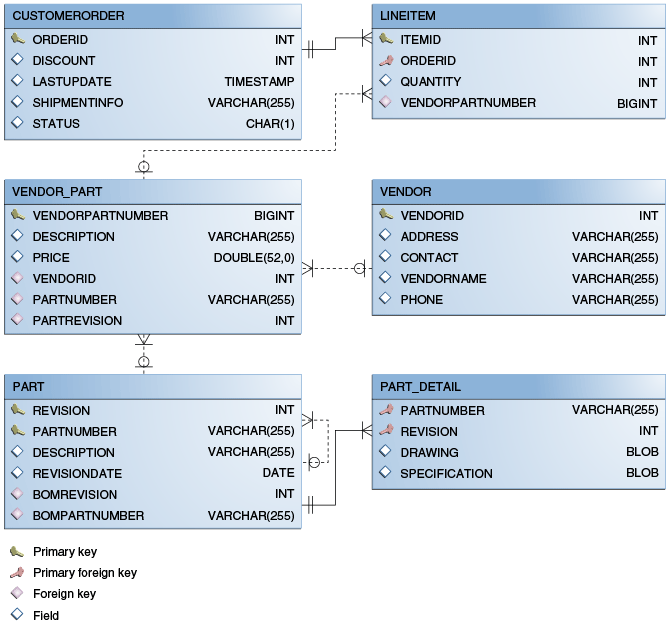 VendorPart uses a generated primary key value. That is, the application does not assign primary key values for the entities but instead relies on the persistence provider to generate the primary key values. The @GeneratedValue annotation is used to specify that an entity will use a generated primary key. The @TableGenerator annotation is used in conjunction with @GeneratedValue's strategy=TABLE element. That is, the strategy used to generate the primary keys is to use a table in the database. The @TableGenerator annotation is used to configure the settings for the generator table. The name element sets the name of the generator, which is vendorPartGen in VendorPart. The PERSISTENCE_ORDER_SEQUENCE_GENERATOR table, whose two columns are GEN_KEY and GEN_VALUE, will store the generated primary key values. This table could be used to generate other entities' primary keys, so the pkColumnValue element is set to VENDOR_PART_ID to distinguish this entity’s generated primary keys from other entities' generated primary keys. The allocationSize element specifies the amount to increment when allocating primary key values. In this case, each VendorPart's primary key will increment by 10. The primary key field vendorPartNumber is of type Long, as the generated primary key’s field must be an integral type. A compound primary key is made up of multiple fields and follows the requirements described in Primary Keys in Entities. To use a compound primary key, you must create a wrapper class. In order, two entities use compound primary keys: Part and LineItem. Part uses the PartKey wrapper class. Part's primary key is a combination of the part number and the revision number. PartKey encapsulates this primary key. LineItem uses the LineItemKey class. LineItem's primary key is a combination of the order number and the item number. LineItemKey encapsulates this primary key. For customerOrder, you also use the @JoinColumn annotation to specify the column name in the table and that this column is an overlapping foreign key pointing at the PERSISTENCE_ORDER_CUSTOMERORDER table’s ORDERID column (see One-to-Many Relationship Mapped to Overlapping Primary and Foreign Keys). That is, customerOrder will be set by the CustomerOrder entity. PERSISTENCE_ORDER_PART_DETAIL and PERSISTENCE_ORDER_PART share the same primary key values. The pkJoinColumns element of @SecondaryTable is used to specify that PERSISTENCE_ORDER_PART_DETAIL's primary key columns are foreign keys to PERSISTENCE_ORDER_PART. The @PrimaryKeyJoinColumn annotation sets the primary key column names and specifies which column in the primary table the column refers to. In this case, the primary key column names for both PERSISTENCE_ORDER_PART_DETAIL and PERSISTENCE_ORDER_PART are the same: PARTNUMBER and REVISION, respectively. Entities that have relationships to other entities often have dependencies on the existence of the other entity in the relationship. For example, a line item is part of an order; if the order is deleted, then the line item also should be deleted. This is called a cascade delete relationship. In order, there are two cascade delete dependencies in the entity relationships. If the CustomerOrder to which a LineItem is related is deleted, the LineItem also should be deleted. If the Vendor to which a VendorPart is related is deleted, the VendorPart also should be deleted. You specify the cascade operations for entity relationships by setting the cascade element in the inverse (nonowning) side of the relationship. The cascade element is set to ALL in the case of CustomerOrder.lineItems. This means that all persistence operations (deletes, updates, and so on) are cascaded from orders to line items. Both of these fields use the @Column annotation and set the table element to the secondary table. This EntityManager instance is a container-managed entity manager, so the container takes care of all the transactions involved in managing order's entities. The ConfigBean singleton session bean is used to initialize the data in order. ConfigBean is annotated with @Startup, which indicates that the EJB container should create ConfigBean when order is deployed. The createData method is annotated with @PostConstruct and creates the initial entities used by order by calling RequestBean's business methods. The first argument of EntityManager.find is the entity class, and the second is the primary key. The Query.getSingleResult method is used for this query because the query returns a single value. You can use either NetBeans IDE or Maven to build, package, deploy, and run the order application. First, you will create the database tables in Apache Derby. In the Projects tab, right-click the order project and select Run. This compiles the source files and packages the application into a WAR file located at tut-install`/examples/persistence/order/target/order.war`. Then the WAR file is deployed to your GlassFish Server instance.